Once you made popiah (you can refer to my post Malaysian Singaporean Chinese Food – Popiah Sarawak Style), you will think of making some Kueh Pie Tee or “Top Hats” or “小金杯“ of which the ingredients for the fillings are basically the same. 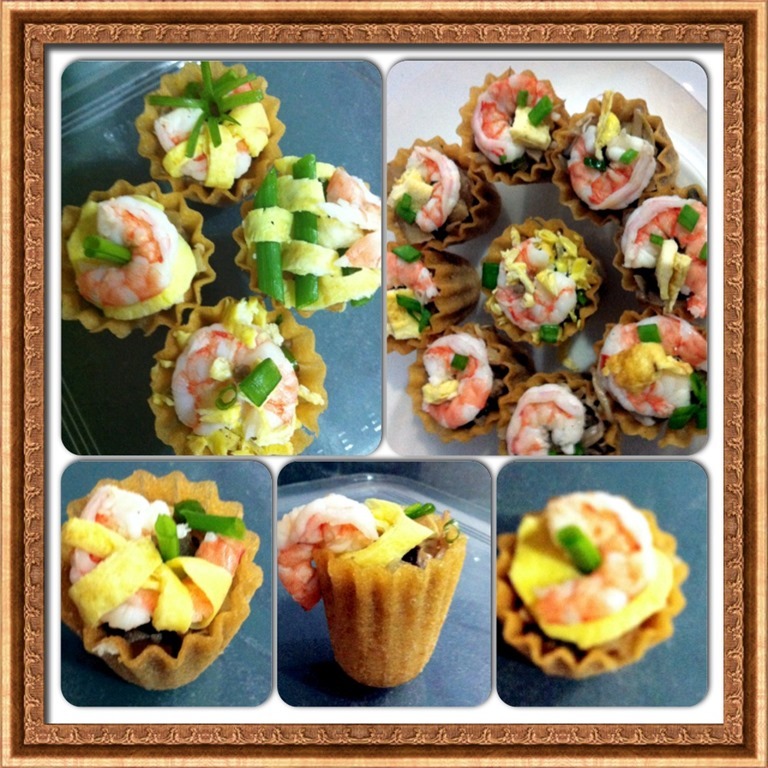 Kueh pie tee are usually served as party snacks and the presentations are usually eye catching and outshine other appetizers. Yesterday, I prepared some kueh pie tee using the fillings left over from making the popiah. Making popiah, as explained in my earlier post, is a laborious “project” that involved using lots of ingredients, processes, kitchen utensils. Therefore, I wouldn’t want to prepare quantity of fillings solely adequate for making the popiah. In addition, I knew very well that if I cannot finish using all the fillings, I can use it for making kueh pie tee, fried spring roll or become a dish for next day’s meals. In fact, it is rather difficult to estimate the exact quantities of the filling required for the popiah due to inconsistency in the sizes of popiah rolled by party guests. Some greedy one would roll a big fat popiah whereas some others may rolled a small one for fear of weight gain, blah blah.blah..
One may questioned whether it is okay to keep overnight the fillings. My answer is yes. Foods will not become bad or contaminated immediately if you have used a clean spoon to scope the fillings and packed it in a clean container before putting it in the fridge. Once in, don’t take it out before your next use. Of course, not too long. My own guideline for keeping these type of vegetable dishes are not more than a week.. Besides the popiah fillings which basically consist of julienned jicama, French beans, taukwa, bean sprouts etc. 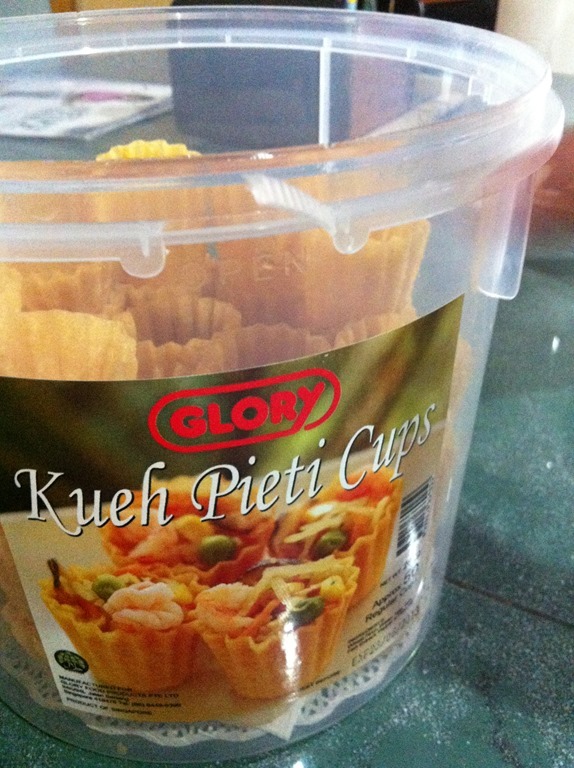 , you will need to have some Kueh Pie Tee cups. To make the Kueh Pie Tee, you will need to have a mold and deep fried your batters in hot oil. The basic ingredients for the batters are plain water and wheat flours. However, most families would claimed that they have the best recipe for the cups with variations in type of flours and liquid which is reasonable since there are only two basic ingredients. Some add rice flour for a firmer texture and would not be soggy that easily or potato starch. Some add melted butter to the batter so that they have a buttery fragrance. Some add gassy drinks like seven up believing that it will be more crispy. Whatever it is, I have decided not to make my own cups and purchased in a rather well known “peranakan” or “nonya” shop in Singapore. The reasons are dual fold. Firstly, I do not have the mold and secondly, it involved large quantities of oils for frying. As at May 2013 (intentionally written down as such for future reference), I bought 50 cups for S$17, working out to be 34 cents per cup. If you are still keen to explore the process of making these cups, please visit here. 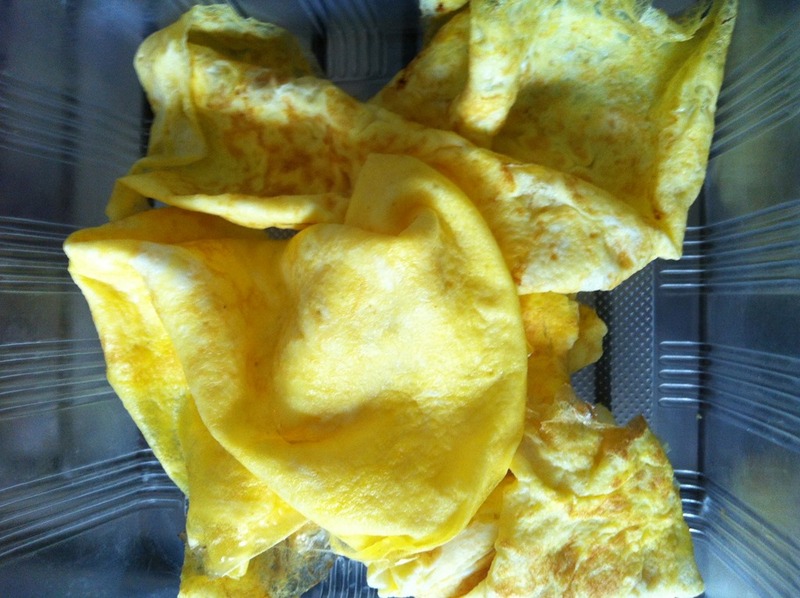 Beside the left over popiah fillings, I have added two fresh ingredients, namely blanched prawns and egg omelets. These two are actually optional. In the olden days, prawns were not included as it is quite pricey. 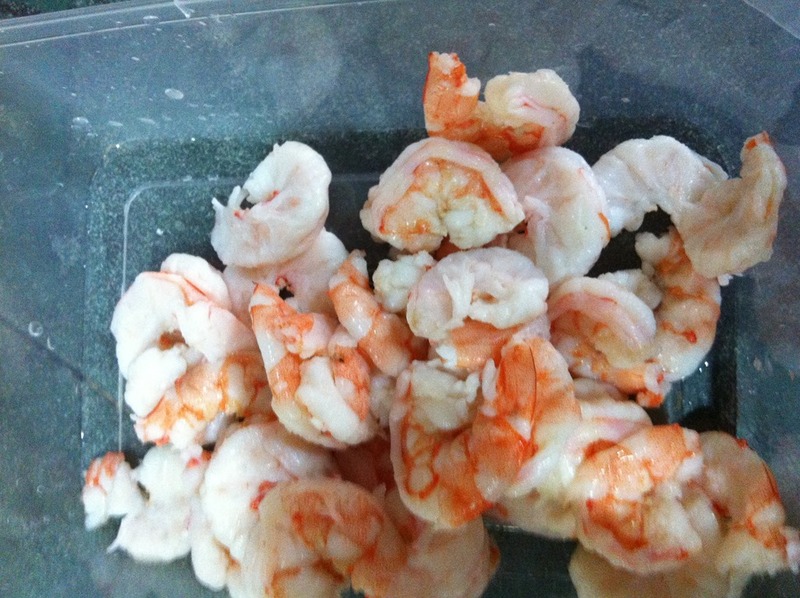 However, with the overall increase of family disposal incomes, people are looking for better quality of foods and prawns were included on the assumption that it will make this traditional delicacy look more presentable and appetizing. It would not be a surprise that in future, abalone slices may be added to show signs of wealth in parties for the rich and famous (since most traditional delicacy such as moon cakes, rice dumplings etc. already have this expensive ingredients added). Eggs are also optional but since it is cheap, might as well add it since my kids love eggs. Top with eggs, blanched prawns and garnished with spring onions or coriander leaves or Chinese celery leaves as necessary. From the steps listed above, is it not simple? In fact, it is. It is that simple. As it is a party snack, how you topped your fillings become a crucial element in attracting the guests to take a bite of your kueh pie tee. You may design your own pattern and I can assure you that there are countless possibilities depending on your own creativities. Kueh pie tee should not be prepared too early in advance as the fillings will make the cups become soggy or not crispy. Therefore, if you are having pot luck parties, it is best that you only fill your fillings may be 10-15 minutes before the party starts. A soggy cup will definitely ruined all the hard works that you have invested in these delicacies. Alternatively, you can consider just give the cups to your guests and let them help themselves. If you looked at my posts, I have intentionally left out the exact quantities of the ingredients for the preparation. My rationale is simple, I am sharing with you how I prepare this in my very own manner and you can use it as a reference in your own context. I believed that I am still far from qualify to teach you how to cook. I always encouraged readers to try their own version after reading my posts. Don’t be ashamed of your own recipes. You should be proud of what you have tailored made for your family or the parties. Since it is not patented like Yangchow Fried Rice, who say kueh pie tee must be prepared like what I said above? 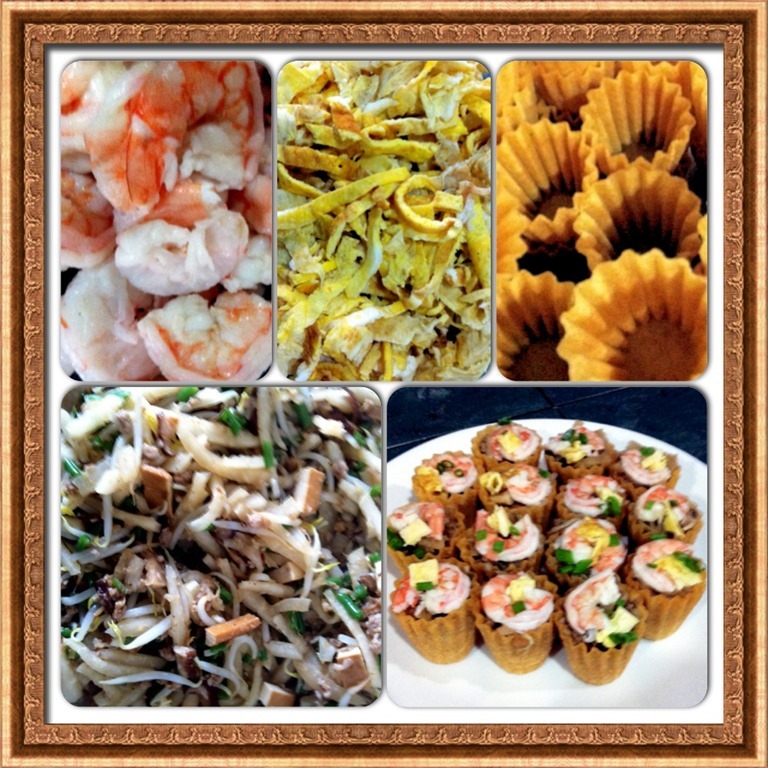 This entry was posted in Dish and tagged 8, CHINESE, delicacies, Food Preparation Series, kueh pie tee, malaysia, nonya, party snacks, peranakan, singapore. Bookmark the permalink.